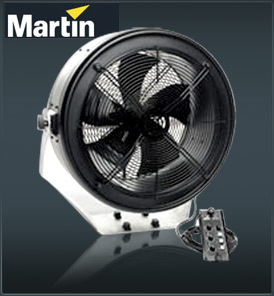 The Martin AF-2 Fan is a high output fully DMX (3 + 5 pin) controllable fan. It has been designed with theme parks, stage applications and theatres in mind. With its massive power it easily projects smoke over long distances, works as a wind effect or simply converts smoke or fog into haze. The physical appearance and unique design gives the unit multiple placement options. • Fan casing constructed from aluminum sheet for minimal weight, only 17kg! • Aluminum hanging bracket allowing 360° rotation, compatible with the Omega clamp system. The fan casing is constructed from aluminum sheet to make it easy for one person to carry; weight has been limited to only 17kg. It is supplied with a low voltage multifunctional remote control (similar to the one supplied with the Martin AF-1) and a flying bracket, also made of aluminum. The flying bracket is compatible with the Omega clamp system known from Martin fixtures. The actual fan motor is sealed to withstand high condensation levels. For added protection and other features the accessory “Touring Frame” is available.